How do I sign up with Ohm? Switching to Ohm is easy. Simply enter your electricity usage details into our online price calculator, pick the Supply Start Date and Price Plan you want and click on “Start Ohm Now”. Then you just need to fill in your personal particulars and we’ll have you going Ohm in no time. And don’t worry if you’re currently with another electricity retailer. Once you’ve submitted everything we need, we’ll take care of the transfer process. You won’t have to lift a finger. Will my electricity supply be cut-off when I make this switch? Not at all. Switching electricity retailers doesn’t change where your electricity comes from. So you’ll continue to enjoy the same great electricity supply as before. Do I need to replace my meter if I want to switch to Ohm? Nope, you don’t have to do anything at all. Your existing meter works just fine for us. If you wish to change to a Smart Meter, please let us know after the signup process via our Customer Portal or drop us an email at customer-care@ohm.sg. Do I need to undertake any meter readings for my switch? Yes. If you’re switching to Ohm during a billing cycle, then SP Group needs to allot your electricity usage to the correct retailers. This is just to make sure that you’re paying the correct amount to your current retailer. So you’ll have to provide them with a meter reading. There are two ways that you can do this. You can let SP Group estimate your meter reading based on your past electricity usage, or you can read the meter yourself. If you choose to do a self-reading, you must submit the reading to SP Group 1 to 3 business days before your Supply Start Date. You can submit your meter reading via WhatsApp at 9622 6557, Open Electricity Market website, or call 1800-222 2333.For more details, please refer to "How do I read my own meter?". When can I start receiving electricity from Ohm? You’ll get electricity from us on the agreed Supply Start Date. If you’re switching over from SP Group, this can happen on a date that's best for you. However, if you’re switching from any other retailer, you’ll have to check the end date of your agreement with them. You can switch before the end date of your agreement, but that might come with an early termination fee. If you’re moving to a new premises, please ensure that your Supply Start Date is after the Electricity Turn-On Date, as indicated by SP Group. What is the MSSL Account Holder Name? Typically, this is the name of the individual that opened the utilities account with SP Group. It’s usually the name found on the utilities bill that comes from SP Group. What is the SP (EBS) or MSSL Account Number for my premises? The SP (EBS) Account is the number that SP Group issued for your premises when you opened a utilities account with them. If you are currently with SP Group, you will you will have to key in this number under the “SP/MSSL Account Number” field when you enter your details. It is a 10-digit number that can start with 0 until 8. You can find this on the top right corner of your SP Group utilities bill. The MSSL Account number is the number that SP Group issued for your premises when you switched out of SP Group to another retailer. The MSSL Account Number is tagged to your premises address, so it’ll only change if you’re moving premises. It is a 10-digit number that starts with 9. If you are currently on another retailer other than SP Group, you will have to key in this number under the “SP/MSSL Account Number” field when you enter your details. You can find your MSSL account number on your current electricity bill. If it’s not there, just drop your current retailer a line and they should be able to help you with this. What do I do if I don’t have a MSSL or EBS Account Number? Don’t panic. Contact SP Group and open a utility account with them. Once your application has been approved, SP Group will send you a confirmation letter within 3 business days. After that, it’s just as simple as popping by our Website and signing up with us. Just ensure that your Supply Start Date is after the Electricity Turn-On Date, as indicated by SP Group. Why do I have to enter a verification code before I can complete my signup with Ohm? We’re just being cautious. We don’t want there to be any misuse of your account. What should I do if I didn’t receive a verification code? If you are having problems getting a verification code from us, you might need to check that you’ve entered the right mobile number. We usually send out Welcome Emails within 30 minutes of receiving your online application. If you didn’t get the email from us, you might need to check your junk or spam folders. Be sure to mark the email as “not junk” and add Ohm to your Safe Senders List. If the Welcome Email is not in your junk folder either, give our Customer Care a call at 1800-835 6463 and we’ll see how we can sort it out for you. What should I do if I received the wrong Agreement terms? Call our Customer Care at 1800-835 6463 immediately. We’ll help you with amending or cancelling your application so that you won’t get charged with unnecessary fees. Is it possible to have Ohm as my electricity retailer for multiple addresses? Yes, as long as you’re the MSSL Account Holder for all the premises involved. You can sign up with Ohm for your other locations the same way you did with your first address. Simply register the same email address for your other locations and you’ll be able to see data for them all in your Customer Portal. If, however, you’re not the SP/MSSL Account Holder, we can’t allow you to add more addresses to your Ohm account. This is a precaution we take to prevent unauthorized persons from switching electricity accounts. Do Ohm’s Price Plans include GST? All prices quoted on our Website are in Singapore Dollars and inclusive of applicable Goods and Service Tax (“GST”). This way, you can easily compare our prices with those from SP Group or other electricity retailers. You can toggle the GST on/off by clicking on the GST checkbox that's next to the Price Plans. All prices are shown inclusive of GST during the switching process. How does Fixed Ohm work? It’s a Price Plan that guarantees you a fixed electricity rate (cents/kWh) throughout a fixed Supply Term. Your monthly electricity bill will be your electricity usage multiplied by your contracted fixed price during the Supply Term. Should you decide to terminate your Agreement before your Supply End Date, there will be a charge an Early Termination Fee. How does Simply Ohm work? It’s a subscription-based Price Plan with an electricity rate (cents/kWh) and a monthly fee ($/month). We may adjust both the electricity rate and monthly fee from time to time. We’ll usually give you a heads-up at least 10 business days in advance if there’s a rate change coming. Because the Price Plan is subscription-based, you can terminate at any time if you feel like it’s not working out anymore. How does Ohm Discount work? We take the SP Group Regulated Tariff, apply a discount, and give you the resulting electricity rate (cents/kWh). Do note that SP Group’s tariff changes quarterly, while our discount rate (%) is fixed throughout your Supply Term. How does Market Ohm work? You pay Wholesale Rates for your electricity. In the electricity market, the Wholesale Rates vary every half hour, so the electricity rate ($/kWh) that you pay will change as well. The price is publicly available here. It is the price that all generators receive, and all retailers pay. If you choose Market Ohm, we pass the Wholesale Rate to you without a mark-up. You’ll also notice that we charge a small monthly fee ($). This is just a little something for us to look after you. This fee may be adjusted from time to time, but we’ll let you know 10 business days in advance if a change is about to happen. And in keeping with being completely transparent with you, we’ll include a complete price breakdown of your Third Party Charges in your monthly electricity bill. Market Ohm is a subscription-based Price Plan, so you can terminate at any time. What is Market Ohm’s Price Cap feature? Because Market Ohm uses Wholesale Rates, your electricity bill may fluctuate monthly. If you are concerned with this price fluctuation, you can choose to “cap your bill”. For less than a cent extra per kWh you will never pay more in a month than if you had stayed on SP Group Regulated Tariff. The additional fee (cents/kWh) will be added to your Market Ohm Price Plan. The fee and the price cap may be adjusted from time to time. We'll usually let you know at least 10 business days in advance. What is the difference between Fixed Ohm and Simply Ohm? While the electricity rate of both Price Plans includes all Third Party Charges, the similarities end there. Simply Ohm’s electricity rate and monthly fee may be adjusted from time to time, and the plan is on a subscription basis. Fixed Ohm, on the other hand, has a fixed electricity rate for a fixed Supply Term. How does the CO2 Offset Add-on work? What is a Carbon Tax and does Ohm include the Carbon Tax in our charges? A Carbon Tax is a charge levied on greenhouse gas (GHG) emissions, with the ultimate aim of reducing the volume of emissions produced. The Singapore Carbon Pricing Act of 2018 is a regulation that will come into effect in 2019, requiring certain business activities that generate Carbon Dioxide equivalent GHGs of more than 25,000 tonnes to be liable for a Carbon Tax. Electricity Generation facilities will in all likelihood be liable for the Carbon Tax. This will be a cost that will be factored and passed through into the wholesale price of electricity also known as the Uniform Singapore Energy Price (USEP). Consumers will not be directly liable for any additional carbon taxes on their electricity consumption. Ohm is not directly liable for any Carbon Taxes and does not include the Carbon Tax as a separate line item in our charges. What are Third Party Charges? Do note that Third Party Charges are subject to changes by the various regulatory bodies. Changes to the charges typically take effect immediately and, where applicable, will be billed to you. The Third Party Charges listed in the table are indicative and for information only. We do not guarantee or warrant the accuracy, completeness, timeliness of the information provided. Are Third Party Charges included in the electricity rate of my Price Plan? It depends on which Price Plan you’ve chosen to go with. If it’s indicated in your Price Plan details that your electricity rate is “all-inclusive”, it usually means that the Third Party Charges are already included in your electricity rate. If I change my mind, can I switch to a different Price Plan? Sure, no worries. You can change your Price Plan at any time using the Customer Portal. A Price Plan Change Fee may be applicable. You can see how much this fee is when you’re making the change on the Customer Portal. Once you’ve completed the change process, we’ll send you an email with the details of your new Agreement. Your new Price Plan will come into effect at the start of your next billing cycle as indicated in the Customer Portal and in your new Agreement. Do I need to inform Ohm if there’s been a change in my Average Monthly Usage? Yes. We rely on the accuracy of our customer’s data to ensure that we offer you the best rates possible. You can drop us a message via the Customer Portal or call our Customer Care at 1800-835 6463 to let us know of any such change. Does Ohm require a security deposit? Yes, your security deposit is collected and retained by SP Group on our behalf but this can be collected in two ways. If you were previously purchasing electricity from SP Group at the regulated Regulated Tariff or from a retailer that is using SP Group for billing services before you switched to Ohm, SP Group will allocate 65% of the security deposit that you have set aside with them as Ohm security deposit. So, technically, you don’t have to fork out any money, or do anything at all. If you were purchasing from a retailer other than SP Group, or a retailer that is not using SP Group for billing services before you switched to Ohm, the initial security deposit will be equivalent to 65% of the security deposit as determined and published by SP Group for its residential premises utilities account. What happens to my security deposit when my Agreement with Ohm ends? If you were previously purchasing electricity from SP Group or from a retailer that is using SP Group for billing services before switching to Ohm, we will, unfortunately, not be able to refund your security deposit to you. It will remain with SP Group to settle future payment obligations for your other utilities. If you were previously purchasing electricity from a retailer other than SP Group or a retailer that is not using SP Group for billing services before your switch to Ohm, your security deposit less any deductions will be returned to you after you have paid all outstanding bills and satisfied any other obligations, if applicable. To make things easier for you, we may use your security deposit to settle your final bill. Check out our detailed guide to understanding your bill here. When and how will I get my bill? We’ll bill you monthly for the electricity you’ve used during the last billing period. Your electricity charges will appear on the utilities bill you get from SP Group, and they are calculated based on the usage data that we receive from SP Group. This usage data is usually rounded to 2 decimal places on your bill. Why are my Ohm electricity charges on my SP Group utilities bill? SP Group acts as the billing agent for Ohm. This means that all your utilities charges are consolidated into one bill – making life much simpler for you. How can I settle my monthly bills? SP Group acts as the billing agent for Ohm. They offers various ways, such as cheque or GIRO, for you to settle your monthly bills. If you’re currently paying your monthly SP Group utilities bill using GIRO, you do not need to submit another GIRO form when you switch to Ohm. All existing payment arrangements you have with SP Group for your current utilities bill will remain. If you have any questions regarding your payment options, drop us a message via Customer Portal or call our Customer Care at 1800-835 6463. You can find your account balance for the electricity portion of your utilities bill on your Customer Portal. Alternatively, you can log into SP Utilities Portal or use the SP Utilities App to check your account balance for your total SP Group utilities bill. What are Ohm’s payment terms? Our payment terms are the same as SP Group’s terms – the payment of your utilities bill from SP Group is due 14 calendar days from the bill date. Can I change my billing cycle for electricity? Unfortunately, you don’t have the option to change your billing cycle. SP Group aligns the billing cycles of all utilities, such as gas, water and electricity, to optimise the deployment of meter readers to a reading area. A change in billing cycle can only be initiated by SP Group for operational reasons. Why does my billing cycle for electricity differ from the other utility services? SP Group is required to perform a validity check on your electricity meter data before it is sent off to the Energy Market Company (“EMC”) for market settlement purposes. This validation process takes a couple of days. Other utility meters follow a separate check process, and thus, the billing cycle for electricity differs from the one for the other utilities. SP Group currently assigns each household with a billing cycle. For example, your billing cycle runs from 17th of the month to 16th of next month. This cycle may change (+ or - a few days) depending on when the meter reader goes down to your premises on the last day of the billing cycle to read your meter (electricity, water and gas). The meter reader does this every alternate month. Upon verification, SP Group then sends Ohm your usage data 9 business days after they have read your meter for that billing period so that we can bill you accordingly. If you are on an AMI meter, SP Group takes 5 business days to send us your usage data. In this example, your first Ohm bill will be from 3 April 2018 to 16 April 2018. 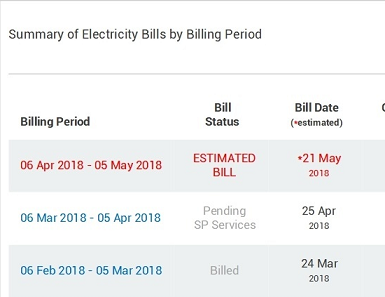 SP Group will likely send your utilities bills (Water, Gas, Electricity and Refuse) on or after 16 May 2018. The second Ohm bill will be from 17 April 2018 to 16 May 2018, which means that SP Group will likely send your utilities bills on or after 16 June 2018. What does the Summary of Electricity Bills by Billing Period in my Ohm Customer Portal show? We understand that getting the accurate information as soon as possible is of importance to you. We have built a feature in our customer portal so that you can view your electricity bill estimates once we have the information on hand to do so. Can I switch from paper bills to electronic bills, or vice versa? Of course, you can. Do note that this change will be applied to your utilities bill from SP Group. You can change how you want to receive your bills by contacting us through our Customer Care at 1800-835 6463 or via the Customer Portal. Alternatively, you can also change your billing option via the SP Utilities Portal or through the SP Utilities App. It may take up to 30 days for the switch to be completed. Can I consolidate all the electricity charges for my various premises under one bill? Unfortunately, we’re unable to consolidate your electricity charges for different premises, because each premises has a separate MSSL Account Number. This means that each premises will require a separate bill. Do I need to terminate my Giro when my Agreement with Ohm ends? No, you don’t have to because you can continue paying via Giro for your other utilities services from SP Group. If you close all your utilities services, Giro will automatically be terminated after all final and outstanding charges with SP Group are cleared. Why didn’t my electricity charges appear on my SP Group utilities bill? In the very rare instance that there is a major system failure, we may not be able to send your electricity charges to SP Group. You will receive an email notification about this technical issue, and your electricity charges for that month will be reflected in your next bill. What should I do if my electricity charges are wrong? Let us know immediately. You can contact us through our Customer Care at 1800-835 6463 or via the Customer Portal. We’ll have it sorted out for you. Why is there a metering adjustment on my bill? There can be two reasons as to why you will see a metering adjustment on your bill. The current meter infrastructure is owned by SP Group. SP Group's meter readers read your meter every two months. Your usage is estimated by SP Group in the month that your meter is not read. After your actual meter reading, SP Group then sends us updated meter usage data (if any) to account for under/over estimation for the month that your meter is not read. We then adjust the amount you would have been billed as a result of this updated meter data received from SP Group. It can also be due to faulty electricity meter. If your meter is found to be faulty, SP Group will replace your electricity meter and adjust your meter reading data for the period whereby the meter is deemed faulty. You can check and download your adjusted usage data via the Customer Portal. Ohm will adjust your bill based on the correct meter readings. Any difference in the charges will be refunded or debited to you. What is a billing adjustment? These are adjustments for billing errors which are not caused by meter errors. What is the Transmission Loss Factor? The Transmission Loss Factor is a scaling factor applied at the metering point to account for network and transformer losses. This factor varies depending on voltage levels and is as defined in the Metering Code. The factors are derived using the methodology approved by the Energy Market Authority (“EMA”). How is the Transmission Loss Factor (TLF) included on my bill? The usage data that we receive from SP Group is adjusted for TLF, i.e. metered usage x TLF. Residential customers fall under the 230V/400V category of TLF published by SP Group, which is 1.03493 as of 1 April 2018. For customers on Fixed Ohm, Ohm Discount and Simply Ohm, we will bill you based on your metered usage. The quoted price is all-inclusive and we have absorbed the transmission loss. For customers on Market Ohm, as this is a cost pass-through contract, we will continue to bill you based on usage adjusted for TLF. You may also refer to the SP Group’s website for more information on TLF. SP Group provides all metering services and meter data management to all households and businesses in Singapore. When does my meter get read? If you have a Cumulative Meter, SP Group will read your meter once every two months. For the months when your meter is not read, you can submit your self-meter readings, or let SP Group estimate your usage. The estimated consumption will be adjusted in the following month when the actual reading is taken. You can see your next scheduled meter reading date on your utilities bill from SP Group. If you have a Smart Meter, your meter date will be sent to SP Group daily and consolidated into a monthly usage amount. How does SP Group estimate my usage? During the months when your meter is not read, SP Group will calculate your estimated usage by multiplying the average daily usage between the last two actual meter readings by the number of days in the current billing period. The estimated consumption will be adjusted in the following month when the actual reading is taken. How can I be billed based on actual meter readings every month? There are two ways you can go about this. You can either install a Smart Meter, or read your own meter on the estimation month. If you opt to perform a self-reading, you must submit your readings to SP Group via WhatsApp at 8482 8636, the SP Utilities Portal or through the SP Utilities App. You can find the submission period in a message on your utilities bill from SP Group, on the SP Utilities Portal or the SP Utilities App. If you wish to change to a Smart Meter, please contact us through our Customer Care at 1800-835 6463 or via the Customer Portal. How do I read my own meter? There are at least two utility meters outside your house. They are used to record your electricity, water and/or gas usage. The electricity meter measures the amount of electricity that you’ve used in kilowatts per hour. You only need to read the numbers in black on your meter. What are my meter options? You can choose to retain your existing Cumulative Meter, or install a Smart Meter. You can contact us through our Customer Care at 1800-835 6463 or drop us a message via the Customer Portal if you wish to change your meter. What is the difference between a Smart Meter and a Cumulative Meter? Both meters can measure your monthly usage reliably. The main difference between the two lies in their ability to measure your usage profile, which varies over the course of a day. A Smart Meter can measure your half-hourly usage and provide your electricity retailer with an accurate daily usage profile. The Cumulative Meter only measures your aggregated usage between two meter reading dates. With this meter, your daily profile is derived from a Static Residential Load Profile (“SRLP”). Do I need to install a Smart Meter for my premises? It’s not compulsory to install a Smart Meter, but if you’ve chosen to go with a Price Plan that is linked to the half-hourly Wholesale Rates, like Market Ohm, or if your usage pattern strongly differs from the Static Residential Load Profile (“SRLP”) having a Smart Meter can be beneficial. You can contact us through our Customer Care at 1800-835 6463 or drop us a message via the Customer Portal if you wish to change your meter. How much do I have to pay for a Smart Meter? You will need to pay a one-time installation fee for your Smart Meter. This is a one off fee, currently charged at $42.80 inclusive of GST and is determined by SP Group. Can I switch from a Cumulative Meter to a Smart Meter? Yes, you can, but SP Group may charge you an installation fee for this, which we’ll have to pass on to you. You can contact us through our Customer Care at 1800-835 6463 or drop us a message via the Customer Portal if you wish to change your meter. How can I see how much electricity I’ve used? You can review and download your half-hourly usage data by logging into your SP Group Customer Portal or via the Open Electricity Market Portal. Why is my electricity usage higher than the national average? Usage patterns and lifestyles differ for every household, so your electricity usage may not be the same as the national average. Is it normal for electricity usage to increase during the middle of the year? In short, yes. The average temperature for April to August tends to be higher than the beginning and end months of each year. During the hotter season, you may see a rise in electricity usage due to the increased use of air-conditioning. You can view the national average household usage for various type of residences here. I am moving premises. Can I transfer my Agreement with Ohm to my new premises? Yes, you can transfer the terms of your current Agreement to your new premises. First, you’ll need to contact SP Group to close your utilities account (electricity, gas and/or water) for your current premises and open a new utilities account for your new premises. Do note that you can close and open your utilities account only up to one month in advance. Once your moving request has been approved, SP Group will notify us about the Electricity Turn-Off Date of your current premises. At the same time, you will also have to open a new utilities account with SP Group for your new premises. You will be given a new SP Group utilities account number. After that, don’t forget to provide us with the details of your new premises, as indicated by SP Group, via your Customer Portal before the Electricity Turn-Off Date of your current premises. If you fail to do so, we’ll proceed with the termination of your current Agreement and you may be charged an Early Termination Fee, if applicable. We’ll create a new Agreement with the details of your new premises, while keeping the terms of your previous Agreement. An email with the terms of your new Agreement will be sent to you. How long in advance do I need to close or open my utilities account with SP Group? SP Group needs at least 7 business days to close your utilities account and open a new account. You can trigger the moving process up to one month in advance with SP Group by using the online moving form. Why can’t I select a Supply Start Date when I’m transferring my Agreement? Your new Agreement will automatically start after your previous Agreement has ended and electricity has been turned-on at your new premises. So you can’t choose a different Supply Start Date. Will Ohm be transferring my GIRO arrangement to my new utilities account? Unfortunately, we’re unable to help you with this transfer. A new utilities account comes with a new MSSL Account Number. For security reasons, the bank will require a new set of written instructions for this new account to have GIRO set up. When can I renew my Agreement? You should renew your Agreement one month before it’s stipulated to end. You can visit your Customer Portal to check if your Agreement is up for renewal. We’ll also send you an email to remind you when your Agreement is about to come to an end. Agreement renewals only apply to Price Plans with a fixed Supply Term, like Fixed Ohm. Can I choose a new Price Plan once my current Agreement expires? 1. Log-in to your Ohm Customer Portal. 2. Select "Electricity Price Tab". You will be able to see if you will be able to change a price plan. 3. Select Change my Price Plan and will be re-direct to leave the current page to our website. 4. Choose the Price Plan and the contract period. 5. Click on "Change Ohm Now" and your information will be auto populated. 6. Proceed to the required steps to Verify and Confirm. You would be on your way to a new Price Plan. 7. If you need to refresh, click on your account name at the top right hand corner to repeat the steps. Can I switch to another electricity retailer or back to SP Group after my Agreement expires? Sure. Just get in contact with us and submit a transfer request via your Customer Portal. Please note that a transfer to a retailer other than SP Group has to be initiated by your new retailer. What if there is a gap between the transfer date to my new retailer and the Supply End Date with Ohm? We’ll automatically renew your current Agreement for this intermediate period. Details of this temporary renewal will be sent to you in a separate email. This temporary renewal will not affect your transfer to your new retailer. What should I do if I want to stay with Ohm, but I forgot to renew my Agreement? Your Agreement will automatically be renewed if we do not hear from you or another retailer. We will renew your Agreement using the same Price Plan and Supply Term as your current Agreement, and at our prevailing rate. If your current Price Plan is no longer available, your Agreement will be renewed using a similar Price Plan. Your new Agreement will start the day after your current Agreement ends, and we’ll send all the details of your new Agreement to you in an email. If I terminate my Ohm Agreement before the Supply Start Date, will I incur a penalty? If you change your mind about Ohm, you can terminate your Ohm Agreement up to 4 business days before your Supply Start Date to avoid penalties. Simply drop us a message via the Customer Portal or call our Customer Care at 1800-835 6463. How do I terminate my Agreement with Ohm? We're sorry that it didn't work out. If you wish to terminate your Agreement with Ohm, get in contact with us and submit a transfer request via your Customer Portal. Also, contact your new retailer to initiate the transfer of your electricity account. Important: If you’ve chosen to go with a Price Plan with a fixed Supply Term, like Fixed Ohm, and you wish to terminate your Agreement and transfer to another retailer during the trial period, please make sure that your transfer date to your new retailer is within the trial period. If you are transferring out of Ohm after the end of your trial period, we may not be able to waive your early termination fee. If we receive a transfer request from your new retailer before you have notified us, or if the transfer date to your new retailer or SP Group is after the end of the trial period, we may not able to waive your Early Termination Fee. Refer to applicable Promotion Terms and Conditions for more information. Can I switch back to SP Group? Yes, of course. You can switch back to SP Group and buy electricity from them at the SP Group Regulated Tariff or at Wholesale Rates. In order for us to initiate the process, please submit your transfer request via your Customer Portal, choose your preferred SP Group Price Plan and select your transfer date. Do I have to pay an Early Termination Fee? An Early Termination Fee will only apply for Price Plans with a fixed Supply Term, like Fixed Ohm, if you terminate after the trial period. If you choose a Price Plan on a subscription basis, you can just terminate at any time and no Early Termination Fee will apply. Refer to applicable Product Terms and Conditions and applicable Promotion Terms and Conditions for more information. How is my Early Termination Fee calculated? We keep it simple for you. You will be charged $42.80 inclusive of GST for every remaining full month left in your Agreement term. Refer to the applicable Product Terms and Conditions for more information. What referral programmes and bonuses do you offer? You can check out our latest programmes and offers on our Promotions page. Your Referral Code can be found in your Welcome Email or your Ohm Customer Portal. How can I see which promotion codes I’ve used? All the promotional codes that you’ve applied will appear in your Customer Portal. You can also find a list of all the people who’ve used your Referral Code there. What should I do if the Referral Code I got from a friend isn’t working? Check with your friend to make sure that you’ve gotten the right code from them. If it still doesn’t work, it could be that Ohm has withdrawn the Referral Programme, or that you’ve already used a Referral Code for another premises. It might also be that you’re trying to use more than one Referral Code. How do I log into the Customer Portal? After you’ve completed your signup with Ohm, you should have received an email with your Customer Portal login details. You can log in using the temporary password that we sent you, and change it to a password of your choice once you’ve signed in. You can do this in the Customer Portal by clicking on your name that appears in the top right corner. If you need to change your registered email with Ohm, drop us an email at customer-care@ohm.sg and we will do the necessary for you upon verification. Can I link another email address to my Ohm account? Unfortunately, for security reasons, we cannot allow you to add a second email address. How can I contact Ohm? You can get in touch with us by sending us a message via the Customer Portal, or by giving our Customer Care a call at 1800-835-6463. For urgent matters, please call our Customer Care. Ohm’s Customer Care is operated and managed by SP Group. This means that you’ll still be getting the same great, reliable service that you’ve come to know and love. Am I still entitled to receive GST Voucher- U-Save when I switch to Ohm? Yes, you are. SP Group will continue managing the GST Voucher - U-Save for your utilities account. Where can I find more information about GST Voucher – U-Save? Who can I contact if my electricity lines are damaged or if the power goes out? SP PowerGrid maintains the transmission and distribution network on behalf of SP PowerAssets. If you encounter a problem with your electricity supply, you can contact SPPG’s 24-hour Electricity Service Centre at 1800-778 8888. Where does Ohm’s electricity come from? Electricity is purchased from the National Electricity Market of Singapore (“NEMS”) and comes from the national electricity grid. This means that everyone has access to the same electricity source generated by the same electricity generation plants, and we all have electricity delivered to our premises on a common electricity grid. Why does the website look out of date / are dropdown menus blank and what do you do if you have difficulty signing up online? This most likely due to a cache and cookie issue with the browser. It is recommended that you clear the cookies and cache in your browser and close your browser to complete the process. Our website is optimised for the Chrome browser. If it still doesn’t work, try using the in-private mode in your browser such as “incognito” mode or “incognito window”. Who makes up the electricity market in Singapore? Singapore’s electricity market is made up of the Regulator, Wholesale Electricity Market Operator, Power System Operator, Generation Companies, Transmission Licensee, Retailers and Market Support Services Licensee. Electricity Retailers: They buy electricity in bulk from the wholesale electricity market and compete to sell electricity to consumers. SP Group: SP Group is the Market Support Services Licensee (“MSSL”). They provide support services like facilitating customer transfers between retailers, and carrying out meter reading and meter data management. They also supply electricity at the SP Group Regulated Tariff or at Wholesale Rates. Energy Market Company (“EMC”): EMC operates and manages the wholesale electricity market. Power System Operator (“PSO”): The PSO, a division of the regulator, Energy Market Authority, is responsible for ensuring a reliable supply of electricity to consumers and the secure operation of the power system. Generation Companies: They compete to generate and sell electricity every half hour in the wholesale electricity market. SP PowerAssets (“SPPA”) and SP PowerGrid (“SPPG”): SPPA is the Transmission Licensee. They own the electricity grid which delivers electricity island wide. SPPG is the agent appointed by SPPA to build and maintain the electricity grid. Energy Market Authority (“EMA”): EMA is the government agency that oversees Singapore’s electricity and gas sectors. As the industry regulator, EMA promotes fair competition, and ensures a reliable and secure energy supply to consumers. How does Singapore’s electricity market work? Generation companies offer electricity at half-hourly Wholesale Rates in the wholesale electricity market. The Wholesale Rates will change based on the demand and supply of electricity. Electricity retailers, like Ohm, buy electricity in bulk from the wholesale electricity market, and bundle them into various price plans for everyday consumers. What does it mean to buy electricity at Wholesale Rates? This means that you’ll be paying for electricity at rates that vary every half hour, depending on the supply and demand conditions in the wholesale electricity market. What is the Regulated Tariff and how does SP Group calculate it? The electricity tariff set by SP Group is reviewed every quarter, and is regulated by the Energy Market Authority (“EMA”) to reflect the actual cost of electricity. This tariff covers two key components – fuel cost and non-fuel cost. The fuel cost, or cost of imported natural gas, is based on the average natural gas price in the previous three months. This helps to smooth out any large swings in the oil markets, which the gas price is tagged to. For households, this means electricity tariffs are reflective of the current market conditions. Electricity Generation Cost: This mainly covers the costs of operating the electricity plants, such as the manpower and maintenance costs, as well as the capital costs of the plants. Transmission Charge: This recovers the cost of transporting electricity through the electricity grid. Market Support Service (“MSS”) Fee: This recovers the costs of billing and meter reading. Power System Operation and Market Administration Fee: These fees recover the costs of operating the power system and managing the wholesale electricity market. What is the Static Residential Load Profile? The Static Residential Load Profile (“SRLP”) is a standard profile assigned to households, as they tend to have similar usage patterns, and vary only in the usage volume. For households installed with a Cumulative Meter, SP Group uses the SRLP, with weights for each half hour of a day, to approximate the household’s monthly usage to a half-hourly usage. This data is used for billing purposes. The SRLP is determined and reviewed annually by the Energy Market Authority (“EMA”).